As a developer, you might have applications that use NoSQL document data. 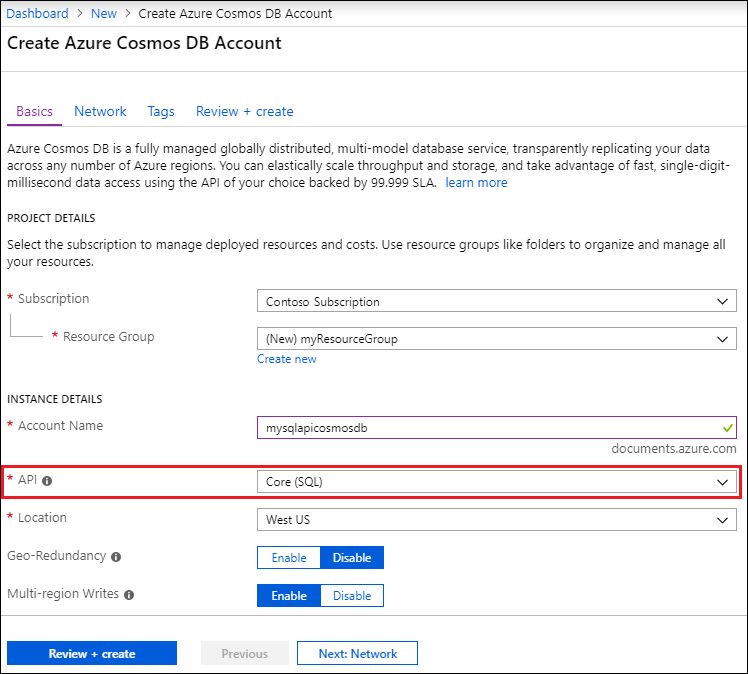 You can use the SQL API account in Azure Cosmos DB to store and access this document data. 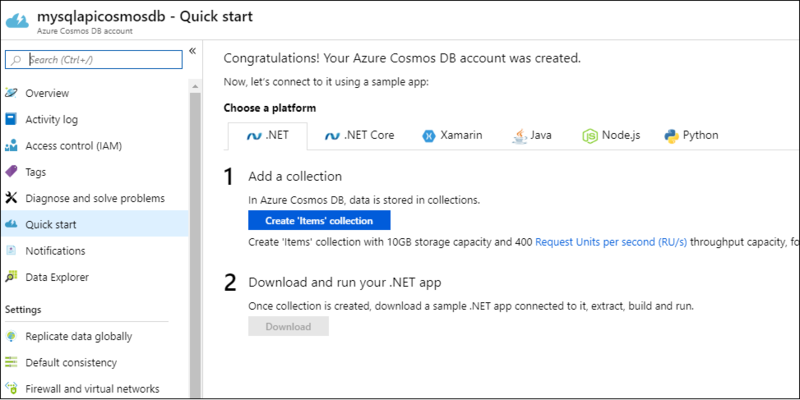 This tutorial shows you how to build a .NET Core app to create and query data stored in the SQL API account of Azure Cosmos DB. Don't have time create the application? The complete solution is available on GitHub. Download and use the free Visual Studio 2017 Community Edition. If you are developing a Universal Windows Platform (UWP) app, you should use Visual Studio 2017 with version 15.4 or higher. Make sure that you enable Azure development during the Visual Studio setup. For MacOS or Linux, you can develop .NET Core apps from the command line by installing the .NET Core SDK for the platform of your choice. For Windows, you can develop .NET Core apps from the command line by installing the .NET Core SDK. Open Visual Studio 2017 on your computer. On the File menu, select New, and then choose Project. 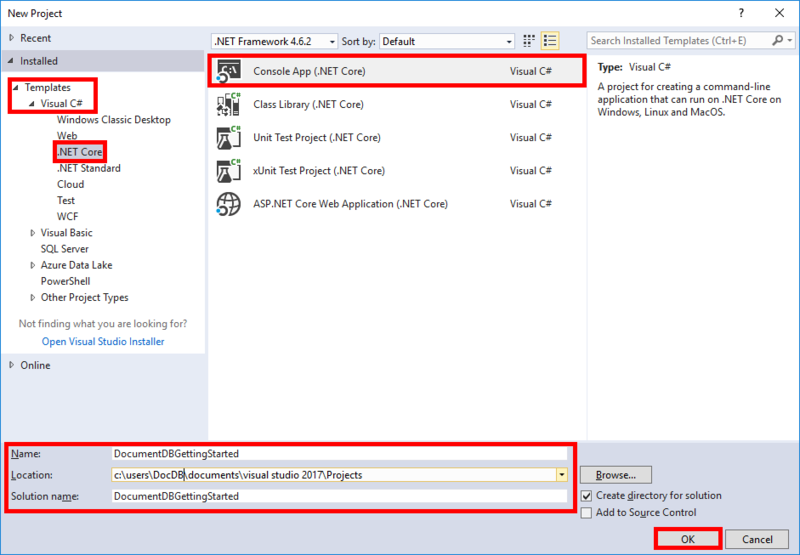 In the New Project dialog, select Templates > Visual C# > .NET Core > Console Application (.NET Core), name your project DocumentDBGettingStarted, and then select OK. In the Solution Explorer, right-click DocumentDBGettingStarted. On the same menu, select Manage NuGet Packages. On the NuGet tab, select Browse at the top of the window, and type azure documentdb in the search box. Ensure that the include prerelease checkbox is checked. In the results, find Microsoft.Azure.DocumentDB.Core and select Install. The package ID for the library is Microsoft.Azure.DocumentDB.Core. If you are targeting a .NET Framework version (like net461) that is not supported by this .NET Core NuGet package, then use Microsoft.Azure.DocumentDB, which supports all .NET Framework versions starting with .NET Framework 4.5. When prompted, accept the NuGet package installations and the license agreement. Now that setup is complete, let's start writing some code. You can find a completed code project of this tutorial on GitHub. Next, add these two constants and your client variable underneath your public class Program. Next, go to the Azure portal to retrieve your URI and primary key. 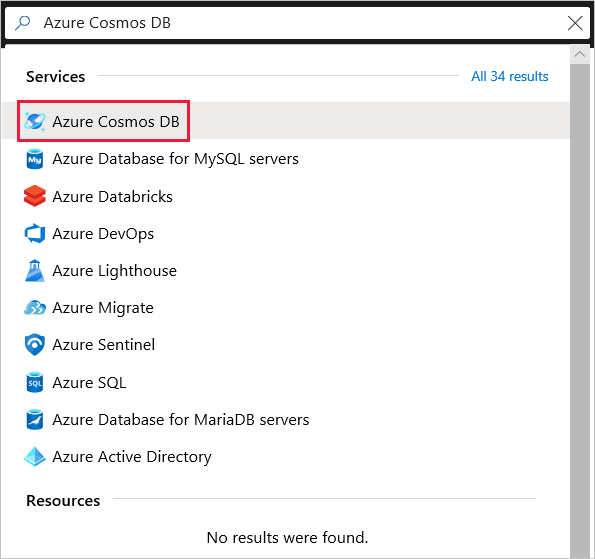 The Azure Cosmos DB URI and primary key are necessary for your application to understand where to connect to, and for Azure Cosmos DB to trust your application's connection. 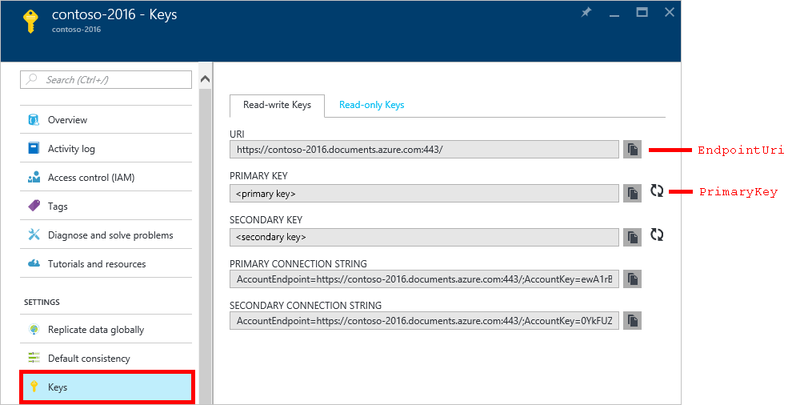 In the Azure portal, go to your Azure Cosmos account, and then select Keys. Copy the URI from the portal and paste it into <your endpoint URI> in the program.cs file. Then copy the PRIMARY KEY from the portal and paste it into <your key>. Make sure to remove the < and > but leave the double quotes around your endpoint and key. We'll start the getting started application by creating a new instance of the DocumentClient. Below the Main method, add the new asynchronous task called GetStartedDemo, which will instantiate your new DocumentClient. Add the following code to run your asynchronous task from your Main method. The Main method catches exceptions and writes them to the console. Select the DocumentDBGettingStarted button to build and run the application. Before you add the code for creating a database, add a helper method for writing to the console. Copy and paste the WriteToConsoleAndPromptToContinue method underneath the GetStartedDemo method. Create your Azure Cosmos DB database by using the CreateDatabaseAsync method of the DocumentClient class. A database is the logical container of JSON document storage partitioned across collections. Copy and paste the following code to your GetStartedDemo method underneath the client creation. This creates a database named FamilyDB. Select the DocumentDBGettingStarted button to run your application. CreateDocumentCollectionAsync creates a new collection with reserved throughput, which has pricing implications. For more details, go to the pricing page. Copy and paste the following code to your GetStartedDemo method underneath the database creation. This code creates a document collection named FamilyCollection_oa. Create a document by using the CreateDocumentAsync method of the DocumentClient class. Documents are user-defined (arbitrary) JSON content. You can now insert one or more documents. 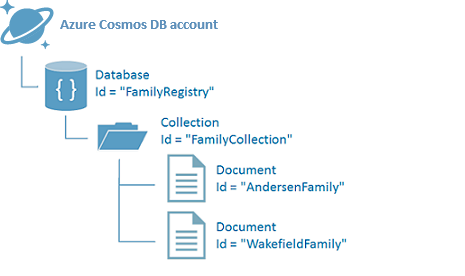 First, you create a Family class that represents objects stored within Azure Cosmos DB. You also create Parent, Child, Pet, and Address subclasses that are used within Family. The documents must have an Id property serialized as id in JSON. Create these classes by adding the following internal subclasses after the GetStartedDemo method. Copy and paste the Family, Parent, Child, Pet, and Address classes underneath the WriteToConsoleAndPromptToContinue method. Copy and paste the CreateFamilyDocumentIfNotExists method underneath your CreateDocumentCollectionIfNotExists method. And insert two documents, one each for the Andersen Family and the Wakefield Family. Copy and paste the code that follows // ADD THIS PART TO YOUR CODE to your GetStartedDemo method underneath the document collection creation. Azure Cosmos DB supports rich queries against JSON documents stored in each collection. The following sample code shows various queries - using both Azure Cosmos DB SQL syntax and LINQ - that you can run against the documents we inserted in the previous step. Copy and paste the ExecuteSimpleQuery method underneath your CreateFamilyDocumentIfNotExists method. Copy and paste the following code to your GetStartedDemo method underneath the second document creation. The following diagram illustrates how the Azure Cosmos DB SQL query syntax is called against the collection you created. The same logic applies to the LINQ query. The FROM keyword is optional in the query because Azure Cosmos DB queries are already scoped to a single collection. Therefore, "FROM Families f" can be swapped with "FROM root r", or any other variable name you choose. Azure Cosmos DB infers that the Families, root, or variable name that you chose references the current collection by default. Azure Cosmos DB supports replacing JSON documents. Copy and paste the ReplaceFamilyDocument method underneath your ExecuteSimpleQuery method. Copy and paste the following code to your GetStartedDemo method underneath the query execution. After replacing the document, this will run the same query again to view the changed document. Azure Cosmos DB supports deleting JSON documents. Copy and paste the DeleteFamilyDocument method underneath your ReplaceFamilyDocument method. Copy and paste the following code to your GetStartedDemo method underneath the second query execution. Deleting the created database will remove the database and all child resources (collections, documents, etc.). Copy and paste the following code to your GetStartedDemo method underneath the document to delete the entire database and all child resources. 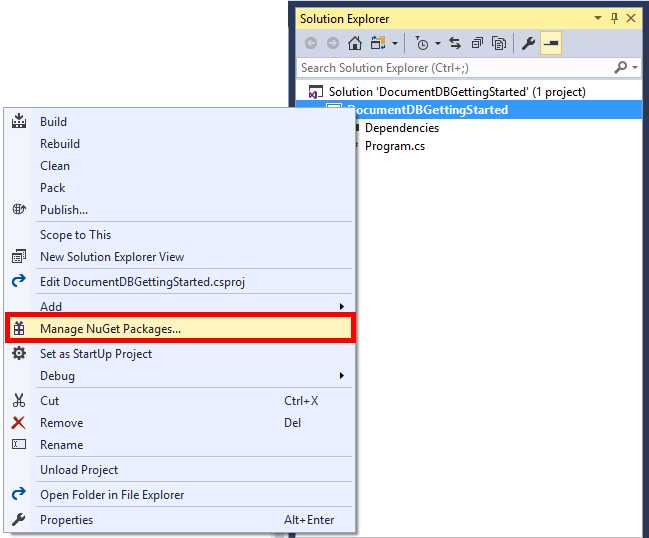 Select the DocumentDBGettingStarted button in Visual Studio to build the application in debug mode. You should see the output of your get started app in the console window. The output will show the results of the queries we added and should match the example text below. End of demo, press any key to exit. You've now completed the tutorial and have a working C# console application. When they're no longer needed, you can delete the resource group, the Azure Cosmos account, and all the related resources. To do so, select the resource group for the virtual machine, select Delete, and then confirm the name of the resource group to delete.